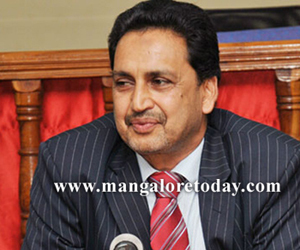 Mangaluru, Mar 19, 2015: To meet better standards and maintain law and order in the district, DK DC Adoor B Ibrahim has directed the officials to install Closed Circuit Cameras in vulnerable public places within a month. At a meeting in his offices on March 16, Tuesday, he said that after discussing with legal experts last week, as police have succeeded in trapping culprits in many cases using CCTV footage, the district administration has decided to install CCTV cameras in specific places. The cameras should be of standard specification with infrared capability, which can record video even in poor light. DC said that cameras should be installed in KSRTC and private bus stands, railway stations, ports, all major markets, inside the airport, in all check posts, Kadri Park, traffic circles, malls, forest check posts, film theatres, Mescom office and counters, excise department (in all bars), in all public schools, government offices, Wenlock and Lady Goschen Hospitals, PWD, post offices, taluk office, and also in petrol and gas bunks, religious institutions and many other vulnerable places. The responsibility of installing cameras in City limits will be given to MCC, he said. Along with this, the DC has also ordered to install CCTV cameras in religious centres like Muzrai temples, prayer halls, Masjids, Dargah and Churches. DCP (Law and Order) Santhosh Babu said that at least four cameras should be installed in religious centres. The minimum resolution of the cameras should be 1080P. Anyone can get the camera specifications in police control room or from commissioner’s office, he said. Also institutions where vulnerable people like physically challenged, aged, sick and so on are housed must have CCTV. CCTV would help to prevent unwanted elements, theft, to give more protection to women passengers in bus stands, children and aged etc..... There are around two million CCTV cameras in London, so it is considered that committing crime is impossible nearly, it could be a model. Additional Deputy Commissioner B Sadashiva Prabhu said that there should be a hard disk of one month storage capacity with the camera. "CCTVs will not affect the private life of any person. It is installed in the DC office already. We have to make compromise in the issue for the safety of the district," the DC addded. There is to be strict implementation of this aspect it is said.